Due to the disturbing scenes in last year and continuing protests in the capital city, Islamabad police realized the need for a properly trained and equipped Anti-Riot Unit. Islamabad Police has established anti-riot unit (ARU) comprising of strong 586 personnel who demonstrated their skills at a mock mob-handling exercise at police lines headquarters on Wednesday. The new anti-riot police unit was formally approved Interior Minister Ahsan Iqbal and terming it a step towards professional and modern policing. Congratulating the ARU of Islamabad Police on completion of training of 586 personnel in the first phase, Ahsan Iqbal said ARU was proposed to be formed to ensure law and order in Islamabad. He said the maximum usage of technology would definitely ensure ease in lives of citizens and further improve performance of police. 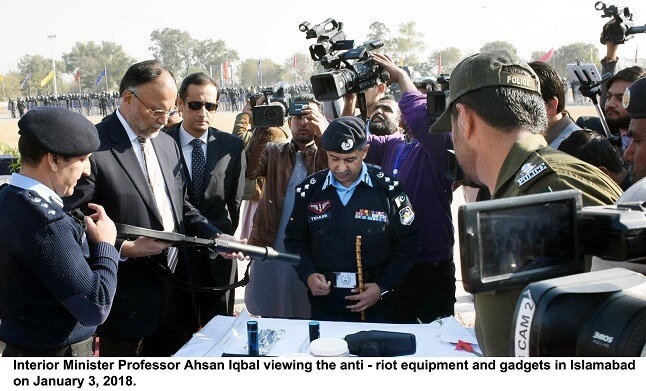 Ahsan Iqbal said the system of policing could not be improved without the participation of community and said he had directed the IGP to introduce reforms to make Islamabad police an exemplary for others. The demonstration ceremony was attended by Inspector General of Police (IGP) Islamabad Sultan Azam Taimuri, chief commissioner Islamabad, officers and officials of Islamabad Police. The officials said that the police were asked to complete the paperwork, including the recruitment process, acquisition of equipment and vehicles for the unit. In the first phase unit consisting of 586 personnel displayed various formations to tackle both, peaceful gatherings and violent mobs to watch and assess any situation and take decision accordingly. The training of the police personnel has already started at the police lines headquarters and though announcement to this effect had also been made nearly a couple of years back by the then interior minister Ch Nisar Ali Khan. However, this time around, the newly-appointed IGP Islamabad Sultan Azam Temuri did not wait for the recruitment process to be officially launched, rather directed for training 586 police personnel immediately for the purpose, reflecting the urgency of the matter. According to IGP Islamabad, Sultan Azam Temuri said ARU will consist of 26 active platoons while a further 200 passive platoons will act as backup. Each platoon would comprise 20 officers, explained Temuri, meaning that as many as 4,000 officers will be in reserves. The ‘reserves’ will consist of personnel working in different wings of the police force and will be called upon as and when the need arises.